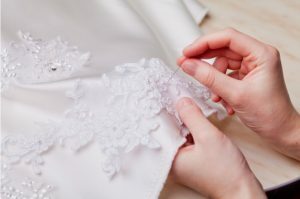 Home > Blog > Blog > What Are Wedding Dresses Made From? Your choice depends on the desired final look. Some fabrics are great for a light look and some look more elegant than others. Keep reading to find out about some of the most common fabrics for making wedding dresses. Satin is a finish that may be made of polyester, silk, or a blend of both. However, most satin wedding gowns are made from pure silk. It is a popular choice for the dresses because of its smoothness, durability, and the fact that it can be used to make almost any type of gown. It is especially great for making ball gowns and draped styles. If you plan on having your wedding during the cooler months, satin is a great choice. Chiffon is lightweight and beautiful. It is usually used in layers because of its sheer nature. The fabric may also be used to overlay other fabrics. Chiffon wedding gowns look simple and floaty. The downside of this fabric is that it snags too easily. The threads can run. This fabric is made from cotton fibres. It is sheer and matte. The wedding gowns made from voile are fun and playful. They are perfect for informal weddings. Lace is used in making elegant wedding gowns. The fabric is mostly used to add detail or as an overlay. There are different styles of lace and each one of them is unique. The fabrics are usually named after their city of origin. Charmeuse is lightweight, glossy, and beautiful. It is the perfect fabric to add a touch of class and luxury to any wedding gown. The only shortcoming of the fabric is that it easily shows flaws. The fabric can be intimidating but it is a great choice for brides who would like to flaunt their curves. It is great for flowing gowns. Organza is a fabric made from silk. It is lightweight, delicate, and much stiffer than chiffon. It is structured and slightly ethereal. If you plan on having your wedding in the warmer months of the year, Organza is the perfect choice. Georgette is made of silk and polyester. It is sheer and matte but not entirely sheer. It is the perfect choice for a sunny wedding. Tulle is light and sheer fabric. It is the type of fabric that is used to make tutus for ballerinas. Wedding gowns made from are fun and they feel airy. The fabric is very delicate. If planning on wearing a ballgown, tulle is a great alternative to heavy fabrics such as duchess satin. There are plenty of fabrics that can be used to make wedding gowns. One of the most popular ones is silk. Some of the most common types of silk include; Mikado, Gazar, and Radzmir. Kate Middleton’s wedding gown was made from Gazar.